Researchers at Princeton and CalTech have developed a way of printing piezoelectric elements onto rubber so that they generate current when the rubber moves. This allows breakthroughs in implantable or wearable energy harvesting systems where the motion of the person powers the electronics, particularly low energy sensors. Being electromechanically coupled, piezoelectric crystals represent a particularly interesting subset of smart materials that function as sensors/actuators, bioMEMS devices, and energy converters. Yet, the crystallization of these materials generally requires high temperatures for maximally efficient performance, rendering them incompatible with temperature-sensitive plastics and rubbers. The researchers have overcome these limitations by presenting a scalable and parallel process for transferring crystalline piezoelectric nanothick ribbons of lead zirconate titanate from host substrates onto flexible rubbers over macroscopic areas. A good supporting point for the global recovery is that, after a 6.7 percent drop in 2009, the global consumer electronics market is expected to achieve a mild recovery in 2010 on the back of LDC TV growth, says iSuppli. Worldwide consumer electronics OEM revenue will rise to $317.3 billion in 2010, up from $312.3 billion in 2009. While a less than 2 percent increase represents only marginal revenue growth, it marks a welcome turnaround after a dismal 2009. The 6.7 percent fall in consumer electronics OEM revenue in 2009 represented the market’s first annual decline since the 1.6 decrease during the dot-com bust year of 2001. Global LCD-TV OEM revenue in 2010 will rise to $75.5 billion, up 5 percent or $3.6 billion, from $71.95 billion in 2009, the largest dollar increase of any consumer electronics segment for the year. The next biggest growth area in terms of dollars will be digital STBs, which will see OEM revenue rise to $18.2 billion in 2010, up $1.9 billion—or 11.6 percent—from $16.3 billion in 2009. Sales are particularly strong in the Asia-Pacific region due to the continued expansion of digital infrastructure, giving increasingly wide swathes of the population access to pay-television content over cable, satellite and the Internet. Global OEM revenue from appliances such as washing machines, ovens and refrigerators is expected to rise to $76.99 billion in 2010, up 2.1 percent or $1.9 billion, from $75.4 billion in 2009—making it the third largest dollar growth area for the year. Other areas expected to experience revenue growth in 2010 include DVD video players, PMP/MP3 players, digital photo frames and handheld video games. In stark contrast to the LCD-TV market, global OEM revenue from plasma television is set to contract by $3 billion in 2010. Plasma television revenue is set to decline to $9.2 billion in 2010, down 24.9 percent from $12.2 billion in 2009. Meanwhile, CRT television revenue is set drop by $2.5 billion for the year as consumers continue to favour flat-panel displays. ed networXX of Austria has produced a development platform especially suited for the design of gaming applications. This platform includes the M-Box embedded computer from congatec, as well as displays that meet the special requirements of gaming applications. By using this package, designers of gaming applications can significantly shorten development times and save development costs. The platform can also be adapted to other applications, such as ATMs or POS terminals. The modular M-Box has been developed in close cooperation with embedded computer module specialist congatec. In its standard version, it allows users to control up to three displays. Its standard processor is a low-power 1.86 GHz Intel Celeron CM440-CPU, which enables the deployment of very quiet fans or even allows for fanless operation. Its high-performance graphics board, the ATI Radeon E2400 MXM-II, is suited for displaying animated high-definition 3D videos. Internal interfaces include 2 x SATA, 1 x USB 2.0 and 1 x PCI Express. The wide range of external interface options include 2 x DVI-I, 6 x USB 2.0 (backwards-compatible with USB 1.1), 2 x serial EIA 232, plus a secure and direct CCTalk link. Direct reading and writing of CF memory cards is possible thanks to the integrated CF card reader. Audio ports generate optimal sound, while 16 digital I/Os allow for customer-specific interface functions. TPM encryption protects the computer and its gaming software, which is especially important in gaming applications. The M-Box runs on various operating systems, including Linux, Microsoft Windows XP/2000, XP Embedded and Windows CE 5.0/6.0. A robust steel housing protects the embedded PC in harsh environments. The standard package features the transmissive Samsung Open Frame Panels LTM 190E4-L02 and LTM 220M3-L02 with a 19 or 22-inch display and a maximum resolution of 1280x1024 or 1680x1050 pixels, respectively. Both panels are able to monitor 16.7 million colours. Their viewing angle is 178° horizontal and vertical, and their 1000:1 contrast ratio makes them suitable for environments with varying ambient-light conditions. The 22-inch model has a brightness of 300 cd/m²; the 19-inch model features 250 cd/m². The fast reaction times of 6 and 7ms are indispensable for gaming applications. Both panels include DVI/VGA interfaces and feature a backlight with four or six CCTFs, and 12V/5A or 24V/2.5A supply, respectively. A robust MicroTouch display by 3M, with a glass thickness of 3.18 mm, can be integrated for touch screen applications. Available interfaces for the touch screen are RS232 and USB. The mean time between failures (MTBF) is over 50,000 hours, which is a necessary requirement for gaming applications. Both the embedded PC and the displays are RoHS-compliant. MIPS Technologies has appointed Sandeep Vij as president, chief executive officer and director. Lately general manager of the Broadband and Consumer Division of network processor company and MIPS licensee Cavium Networks, Vij is a seasoned FPGA executive having worked for both Xilinx and Altera. He succeeds Interim CEO Anthony B. Holbrook, who will continue to serve as chairman of the Board of Directors. According to Holbrook, "The MIPS Technologies Board of Directors is delighted with the appointment of Sandeep Vij as CEO. We anticipate a seamless transition as Sandeep leverages his wealth of experience to not only carry on MIPS' tradition of providing the number one processor architecture for the digital home, but also drive the company in new directions. Sandeep's success in helping to grow major public semiconductor companies will be invaluable as MIPS Technologies focuses on growth and expansion." "Coming from a successful MIPS Technologies customer, I know that MIPS provides outstanding technology, the right ecosystem for its target markets and great customer support. Furthermore, MIPS Technologies' leadership position in the digital home offers a solid platform on which to build its global brand. I am excited to have the opportunity to take MIPS Technologies to the next level of success," said Vij. Anders Electronics has launched the CM-T3530 - the market’s most feature-rich miniature system-on-module based on the TI OMAP3530, which powers some of the world’s most powerful and popular mobile devices. 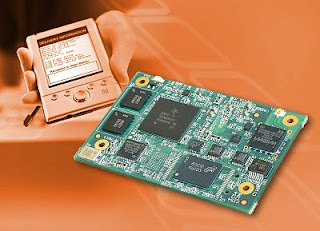 Ideally suited for high-end industrial and medical products, in addition to low-power embedded and commercial applications like multimedia handsets, high performance PDAs, 2G and 3G wireless terminals, navigational devices, mobile TVs, mobile gaming devices, and video conferencing applications – the Anders CM-T3530 provides a rich set of multimedia, connectivity and storage features on a credit-card size system-on-module. Using the power and flexibility of the Texas Instruments OMAP3530 - the processor that powers Nokia's N-series smartphones, the Sony-Ericsson Satio, the Samsung OMNIA HD, and other advanced mobile devices – the Anders CM-T3530 enables embedded systems to provide the usability and connectivity that users expect, while still being extremely developer-friendly. The CM-T3530 is offered with either a TI OMAP3503 or TI OMAP3530 with Cortex-A8 core at 720 MHz, up to 256 MB DDR, up to 512 MB flash disk, a resistive touch screen controller, and 3D and video decoding acceleration. The multimedia-ready system features an LCD interface with resolution up to 1400 x 1050, PAL/NTSC TV output, a camera interface up to 16 Mpixels, and audio codec stereo line-out and microphone. For connectivity, the CM-T3530 offers 10/100 Ethernet, integral WiFi 802.11b/g, 2 SD ports, 3 serial ports, and I2C, SPI and GPIOs. Further, in addition to its two USB2 host ports, the CM-T3530’s high-speed USB 2.0 on-the-go (OTG) port delivers either power to the board or other highly flexible expansion options. From a software point of view, the CM-T3530 is supported in the mainline Linux kernel from rev 2.6.33, and offers full OpenEmbedded Angstrom Linux distribution and full support for Windows CE 6.0 R3. If you think you get a lot of spam, that's nothing compared to the traffic that has already been filtered out. In 2009 the European Network and Information Security Agency (ENISA) launched an Anti-Spam Measures survey, asking e-mail service providers in Europe about the measures they take to combat spam in their networks. This survey provides a view of how the fight against spam has evolved since the last survey two years ago, and found thatjust 4.4% of emails are legitimate. This is a tremendous waste of the embedded resources of the Internet. The survey aimed to determine how e-mail service providers are combating spam on their networks. It helps identifying the state of the fight against spam and helps service providers to learn from their peers throughout Europe. Overall, we hope that this research will aid the industry’s understanding and development of best practices in the fight against spam. fighting spam has reached maturity although continuous adaptation to new techniques is needed. High-volume shipments of Blu-ray players, most of which feature network connectivity, are finally making inroads into the broader disc player and recorder market, says market researcher In-Stat. By 2013, Blu-ray player shipments will still lag slightly behind the 90 million DVD player unit shipments. However, higher average selling prices will put Blu-ray player revenue at more than 4 times as large as DVD player revenue. Shipments of network-enabled Blu-ray players/recorders will approach 80 million units by 2013. 18% of US survey respondents with at least some interest in purchasing a Blu-ray player cited cost as a barrier. Japan dominates the market for Blu-ray recorders. Europe is the largest revenue market for Blu-ray players. The key semiconductor providers supporting the Blu-ray and DVD player/recorder market include Broadcom, NEC, MediaTek, Sunplus and Zoran. The research, “Worldwide Blu-ray and DVD Player/Recorder Market” (#IN1004547ME), covers the worldwide market for DVD players and recorders. French research lab Leti is teaming up with R3Logic, a leading US 3D IC EDA company to combine their expertise in 3D silicon integration and packaging in France to build 3D IC designs and methodologies for consumer and wireless applications. As a major player in the MINATEC excellence centre, Leti operates 8,000-m² state-of-the-art clean rooms, on a 24/7 schedule, on 200mm and 300mm wafer standards. With 1,200 employees, Leti trains more than 150 Ph.D. students and hosts 200 assignees from partner companies and owns more than 1,400 patent families. R3Logic, founded in 2000 in Massachusetts, specializes in the design of 3D integrated circuits and has developed a unique set of patented EDA tools for 3D integrated circuit design. R3Logic has created a new R&D centre in Grenoble, France, to develop and enhance its design tools for 3D heterogeneous system and system-in-package design. This center is part of a newly created French subsidiary, R3Logic-France, which when fully staffed over the next two years will employ over 20 engineers. The centre will also work in close collaboration with STMicroelectronics. Internet security experts Imperva have analyzed 32 million passwords recently exposed in the Rockyou.com breach of security at a social media software developer. Imperva’s Application Defense Center (ADC) analyzed the strength of the passwords in a report, Consumer Password Worst Practices, that analyzes 32 million passwords to help consumers and website administrators identify the most commonly used passwords they should avoid when using social networking or e-commerce sites. · Nearly 50% of users used names, slang words, dictionary words or trivial passwords (consecutive digits, adjacent keyboard keys, and so on). The most common password is “123456”. · Recommendations for users and administrators for choosing strong passwords. For enterprises, password insecurity can have serious consequences. “Employees using the same passwords on Facebook that they use in the workplace bring the possibility of compromising enterprise systems with insecure passwords, especially if they are using easy to crack passwords like ‘123456’,” said Shulman. FlatFrog Laboratories, a startup in Lund, Sweden, developing optics-based multi-touch kits and subsystems, has raised $18m to commercialise its technology with the backing of a UK company. FlatFrog develops a line of large high-performance, multi-touch in-glass displays, initially for the education, gaming, hospitality and digital signage markets. The first product, a 40in full HD touch panel, starts shipping next quarter. The investment was co-led by Blackburn-based Promethean, a specialist in the rapidly growing global market for interactive learning technologies, and Invus, an international equity investor. Futurity Media » Blog Archive » Is the Internet broken? Issues with the security of the Internet and the creation of a group to try to fix it! Toshiba Electronics Europe (TEE) has developed a microcontroller that can be certified to Safety Integrity Level 3 (SIL3) and Automotive SIL D (ASILD) while significantly reducing associated system cost and performance overheads. The Toshiba SIL3/ASILD implementation delivers a more cost-effective solution than alternative methods through a smaller chip size, smaller program requirement and better performance than conventional dual-core lock-step methods. It is based on a hardware architecture that reduces both effort of safety mechanisms and their detection latency. Detailed diagnostic information and the ability to configure the reaction according to the severity of the error allow new system approaches that target higher availability. TEE worked closely with Yogitech, a company specialized in functional safety, and used Yogitech’s fRMethodology based assessment flow and library of Intellectual Properties (fRIPs) in its solution. The fRMethodology is a “white box” approach that was used to do functional safety analysis and safety-oriented exploration of MCU in compliance with IEC 61508 or ISO 26262. The MCU was split into sensitive zones, failure rates were computed for each zone and then used to calculate safety metrics (for example calculating the diagnostic coverage) and to decide chip architecture. A detailed validation was done using fault injection. The fRIPs, certified by TÜV SÜD, are small hardware supervisors designed for MCU sub-block (e.g. CPU, memory) that they supervise with architectural and functional diversity. Other peripheral functions on the chip are monitored by Toshiba’s own hardware diagnostic circuits. Functional safety related system components generally employ duplicated CPU cores (homogenous redundancy): a “mission” core runs the application software and an identical “monitor” core guards the system against dangerous faults in the mission core. A conventional dual-core lock-step SIL3/ASILD approach has to add further protective features, such as a guard ring, separate supply voltage, synthesis and timing diversity, which increase the chip and program size significantly and impact the system performance. Moreover, homogenous redundancy is very much prone to systematic faults. The fRMethodology allowed Yogitech to identify critical zones in the mission core, providing the specification of a monitor core that executes the same instructions as the mission core while excluding unnecessary operations. This process led to the implementation of a separate, optimised monitor core (the fRCPU), eliminating unnecessary hardware overheads while avoiding systematic faults and also significantly reducing the possibility of common cause failures. The fRCPU version implemented by Toshiba in the MCU for the ARM Cortex-M3 has a gate count up to 58% smaller than is used for the mission core. The run-time supervision guaranteed by fRCPU hardware leads to high diagnostic coverage for transient faults while the short detection latency (through a dedicated interface between the ARM Cortex-M3 and fRCPU) allows failed operational to be handled. There are also special measures on chip to avoid latent faults; for example through built-in self test of supervisor circuits or “scrub and repair” function against bit-flips in memories. The Toshiba TSB-TC SIL3/ASILD test chip is available now for evaluation by selected partners. It has received a Technical Report I from TÜV SÜD for SIL3 functional safety operation. In addition to typical automotive peripheral functions like FlexRay and CAN, it offers an operating temperature range of minus 40 to plus 125 degrees Celsius. Marking the start of more widespread adoptionof high speed USB3.0 in system-on-chip devices, design tool vendor and IP supplier Synopsys has developed transaction-level models (TLM) that support that latest high level standard - the Open SystemC Initiative (OSCI) TLM-2.0 API specification. The models are TLM representations of the Synopsys DesignWare SuperSpeed USB 3.0 Device and xHCI Host Controller IP and allow pre-RTL and pre-silicon software development, verification and architecture exploration to speed up SoC designs. With the integration of SuperSpeed USB 3.0 into advanced SoCs and the increasing complexity of software stacks, the need to develop the associated embedded software as early as possible increases. The availability of ready-to-use SuperSpeed USB 3.0 TLM models, which are cross-verified with the corresponding DesignWare SuperSpeed USB 3.0 Interface IP and the associated Linux drivers, enables rapid development of virtual platforms for designs integrating the SuperSpeed USB 3.0 Interface. Virtual platforms enable the concurrent development and debug of hardware and embedded software using an executable model of the hardware long before RTL and first silicon are available. Like all models in the DesignWare System-Level Library, the SuperSpeed USB 3.0 TLM models work in any IEEE1666-compliant SystemC simulator, including Synopsys' Innovator for virtual platforms and VCS for functional verification. Adhering to the TLM-2.0 specification allows for easy integration, with models coming from different sources, regardless of the simulation environment. "A virtual platform software development environment, as provided by Synopsys, is critical to reducing our time to market and overall product cost when delivering our USB 2.0 and SuperSpeed USB 3.0 software stacks," said Terry Moore, CEO of MCCI. "The Synopsys USB virtual platforms developed with Innovator and DesignWare System-Level Library have proven themselves invaluable to MCCI and to our customers many times over. Our USB stack is ported and available for the customer's platform much earlier in their product development than without using virtual platforms. This saves us and our customers critical time." The DesignWare System-Level Library featuring the TLM-2.0 models for SuperSpeed USB 3.0 is available immediately; existing licensees receive it as a regular maintenance update. DS2 in Spain has demonstrated the first live streaming of HDTV using the G.hn draft standard. DS2 also demonstrated its G.hn prototypes support existing UPA technology to ensure backward compatibility with its large installed base of UPA systems. G.hn is the International Telecommunication Union's (ITU) next generation home networking standard. It defines high-speed home network operation over coax, powerlines, and phonelines by the same silicon. The G.hn standard guarantees interoperability by defining a single DLL/PHY technology for home coax, phoneline, and powerline networks, enabling consumers to connect any device using any wire, anywhere in the home. The prototype demonstration ran continuously through CES, providing optimised networking over power, coax and phone lines, exchanging data at throughput that far exceeds today's home network technologies over any medium. The demonstration consisted of the prototypes sequentially connected with coax, powerline, and phoneline and a high data rate feed of multiple content streams sent across their links, to both a PC and a HD TV. The HD content streamed was at full 1080P to ensure the G.hn service was being tested with a service that requires top performance, Quality of Service, and bandwidth. The G.hn coax link operated at over three times the best performance possible with today's legacy coax networking technologies. The phoneline performance was over four times that seen with today's technologies. The powerline performance was also over three times what is possible with today’s legacy technologies. And, using the advanced forward error correction and Quality of Service mechanisms of G.hn, the powerline demonstrations were error-free while operating over live power lines subjected continuously to the extreme RF interference generated within the CES itself. Given the type of real world performance demonstrated, a G.hn home network will be able to stream more HD movies anywhere in the home, with even more bandwidth available for other applications than any other home networking technology available. "Bandwidth requirements in the home network are increasing dramatically due to the way we use and share content and the number of intelligent and energy management devices connected to the home network. At CES 2010, DS2 successfully demonstrated G.hn throughput speeds that support a vast number of simultaneous HD movie streams1. G.hn, with its greater than three times throughput speeds, offers the speed and interoperability to dramatically transform the digital home," said Jorge Blasco, President and CEO of DS2. DS2 also demonstrated interoperability of its current Universal Powerline Association (UPA) based powerline technology with the G.hn prototypes, confirming that DS2's G.hn chips will provide backwards interoperability with today's installed base of UPA devices. To show the ease of UPA interoperability, after a G.hn powerline link was established between two prototypes, one of the prototypes would be disconnected and replaced with a UPA device from one of the many DS2 UPA partners. The remaining prototype would "auto-sense" the change from G.hn to UPA, quickly establish a link with the UPA device, and achieve a throughput rate the same as achieved by a link between two UPA devices. "2010 will be the year G.hn captures the market and begins to replace the many disparate technologies that do not interoperate or perform as G.hn does," said Blasco. DS2 reiterated their announced availability of G.hn-based silicon during Q3 2010, with quantity shipments in Q4. Intel has demonstrated a new 7-foot-6-inch multi-user, multi-touch 'Intelligent Digital Signage' concept system in New York. Intel said the prototype device could change the way people interact with digital signage technology in environments such as stores, airports, banks and hotels. The demonstration emulates a virtual brick-and-mortar store setting where customers may use the multi-touch holographic screen to explore merchandise, find out about promotions, submit feedback on products, read customer reviews, view past purchasing histories and share what they have discovered with their friends via social media and mobile phone integration. Multiple consumers can use this side-by-side window display simultaneously to explore augmented reality-enabled maps of each floor of the store, on which retailers can superimpose images such as coupons and sales promotions next to the product visualizations on the glass, improving the customer's shopping experience. "As stores seek more competitive advantages over online retailers, digital signage has become a valuable technology for dispersing targeted and interactive content to shoppers," said Joe Jensen, general manager, Intel Embedded Computing Division. 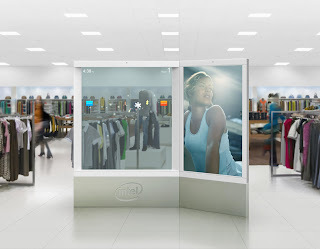 "We therefore designed the Intel Intelligent Digital Signage Concept to show that retailers can engage and interact with consumers in a more personal and compelling manner through new usage models such as augmented reality and interactive product explorations, which in turn could yield an increase in revenue and customer loyalty." Traditionally, retail and digital signage application development has been fraught with difficulty as system development requires the use of many different platforms. To address the need for a more streamlined solution, Intel also announced a strategic relationship with Microsoft to develop an open-standards validated platform for digital signage applications. "With the Windows Embedded and Intel platform, we will provide industries such as the digital signage market with scalable and interoperable solutions that enable applications with rich graphics and interactive capabilities," said Kevin Dallas, general manager, Windows Embedded Business Unit Microsoft. "With this solution, we look forward to delivering endless possibilities to the digital signage industry and beyond." The media player platform, integrated in Intel's concept, is running on the recently released Intel Core i7 processor with Microsoft Windows Embedded Standard 2011 platform optimized for digital signage applications. The jointly developed platform is expected to be available in the second quarter of 2010. This is a slightly off-beat story, but 3D printers that use plastic to build up a 3D structure are an interesting development, particularly with potential in the future to team that with printable and plastic electronics to build a complete system at the desktop. Then the idea of open source hardware becomes very interesting. At the moment, a year after introducing what has become the world’s best-selling 3D printer — the Dimension uPrint — Stratasys of Minneapolis says it has expanded the product line with the uPrint Plus – an enhanced version with lots of new features – while still keeping the price under $20,000. Like the Dimension uPrint personal 3D printer, the uPrint Plus has a small footprint for true desktop use, 25 x 26 in (635 x 660 mm). uPrint Plus can print in eight colors of Stratasys ABSplus material, making it easier for designers to differentiate individual assembly components and better depict their product. The printer has a build envelope of 8 x 8 x 6 in (203 x 203 x 152 mm) – 33 percent more volume than the uPrint, enabling larger models. uPrint Plus offers two resolution settings – 0.010 in (0.254 mm) and 0.013 in (0.330 mm) – to give users additional print options. uPrint Plus also features two support-material enhancements that reduce material consumption and modeling time. The first, Smart Supports, is a software enhancement that reduces material usage by 40 percent, cutting costs. The second, SR-30, is an improved soluble support material that dissolves 69 percent faster, to speed the modeling process. Smart Supports are available for both uPrint and uPrint Plus. uPrint Plus material colors include red, blue, olive, black, dark gray, nectarine, fluorescent yellow, and ivory. The new 3D printer will be available for shipment in March through Stratasys resellers. According to Wohlers Report 2009, Stratasys supplied 43 percent of all additive fabrication systems installed worldwide in 2008, making it the unit market leader for the seventh consecutive year. Stratasys patented and owns the process known as FDM. This process creates functional prototypes and manufactured goods directly from any 3D CAD program, using high-performance industrial thermoplastics. The company holds more than 250 granted or pending additive fabrication patents globally. Stratasys products are used in the aerospace, defense, automotive, medical, business & industrial equipment, education, architecture, and consumer-product industries. Xilinx has developed a new Video Enhancement Reference Design that bundles advanced digital video algorithms with a low-cost Xilinx Spartan field programmable gate array (FPGA) for rapid 'plug-and-play' design of high-definition digital televisions (HDTVs). Developed in collaboration with Vestek Electronics Research and Development, a provider of video processing ICs and IP, the demonstration showcases an off-the-shelf, fully functional design that makes it easier for DTV OEMs to differentiate with picture quality rather than on price alone in high-volume markets. It features a configurable digital image engine specifically developed by Vestek to enhance image and video quality of flat panel LCDs and pre-programmed to run on the Spartan FPGA for the optimal mix of cost, power, and performance. The digital image engine incorporates a suite of production-proven video enhancement algorithms that have been shipping in high volume to the European DTV market. These deliver superior enhancement in color vividness, skin tone, image sharpness, and contrast with each pixel addressed individually instead of universally for the best picture quality and viewer experience. An easy-to-use graphical interface allows designers to adjust parameters and fine-tune picture quality based on the targeted market region. 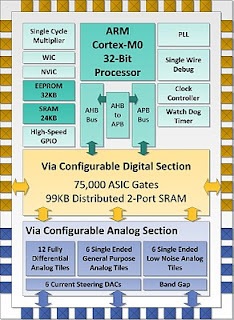 The Spartan FPGA-based solution eliminates the many engineer-hours required to develop and implement similar algorithms in application-specific standard products (ASSPs) or applications-specific integrated circuits (ASICs). "For OEMs entering the HDTV market, there is a strong need to create offerings that stand out from competitive products on the retail shelf," said Harry Raftopoulos, director of consumer segment marketing at Xilinx. "The Consumer Video Enhancement Reference Design combines production-proven IP and silicon with a turnkey approach, enabling DTV OEMs to easily integrate the Spartan FPGA-based solution directly into their systems and quickly ship high-volume products while offering enhanced picture quality without requiring a dedicated team of video algorithm experts." Triad Semiconductor has launched the first system-on-chip (SoC) to integrate the 32bit ARM Cortex-M0 processor core with the via-configurable analogue and digital functions needed to rapidly and inexpensively deliver embedded mixed-signal solutions. Through the via-configurable array (VCA) technology, Triad's Mocha-1T array allows electronic system designers to customize analogue and digital features with lower power consumption and greater system cost savings than last-generation ASIC solutions. The addition of the ARM core allows the ASICs to become a low cost programmable platform. Triad's VCA technology combines silicon-proven analogue, digital, memory and microprocessor resources on a single ASIC die. These resources are overlaid with a global routing fabric. Unique to Triad's approach, all of the resources on a VCA are configured by placing vias within the global routing fabric. Vias are placed on the VCA using Triad's advanced, analogue-aware, via-only automatic place-and-route software, which configures and interconnects the entire VCA without the need for full-custom manual layout, which is an expensive and time consuming problem for ASIC designers. This approach shortens time to prototypes and time to market, reduces development and tooling costs, and accelerates the design process by enabling the reuse of proven mixed-signal IP blocks. "The Mocha-1 platform is the first and only method to combine ARM processing with configurable analogue and digital," said Jim Kemerling, vice president and CTO of Triad Semiconductor. "It is ideal for any applications that require 32-bit performance in an 8-bit or 16-bit footprint with ultra-low power consumption. Our single-mask VCA technology provides safe, rapid prototyping and production at low cost." Triad's Mocha-1 integrates a Cortex-M0 32-bit processor running at 25MHz with 32Kbytes of EEPROM memory, 24Kbytes of SRAM, 75,000 gates of user configurable logic, and a wide selection of analog resources including op-amps, DACs, ADCs, resistors, capacitors, transistors and switches. Combining the Cortex-M0 with these configurable analogue and digital resources allows Mocha-1 to realize a wide range of single-chip, mixed-signal SoC solutions for industrial, medical, sensor, Bluetooth low energy, and military/ aerospace applications. Price is a function of package and production volume, ranging from US $7.00 to $15.00 per ASIC, with customer-optimized solutions available for under $2.00 in high volume applications. Triad is now accepting customer designs for the Mocha-1 array, with silicon being delivered in Q1. iSuppli's teardown of the Nexus One phone shows 4Gbit of DDR2 DRAM and a 1GHZ Snapdragon processor from Qualcomm. 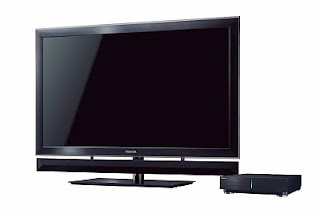 Toshiba America Consumer Products has developed a TV that uses the same Cell Broadband Engine processer as the PlayStation3 and an OLED screen. The heart of CELL TV is the powerful CELL Engine which has 143 times the processing power available in current TV models. This massive power manifests itself in incredibly enhanced picture quality that is certainly the new state-of-the-art. True Super Resolution Technology ensures precise image accuracy by sampling multiple frames and restoring the native pre-sampling signal curve. This process enhances both SD and HD signals for the clearest possible 1080p Full HD picture. Net Resolution+ adds Compression Noise Canceling to significantly enhance Internet content. This system detects noise compression inherent in low resolution internet content and separates and corrects the image data to produce sharper, cleaner internet images, even on super large screens. In addition, AutoView RGB combines an ambient light sensor, and a new RGB sensor, to automatically set the brightness, contrast, gamma, sharpness, color saturation, and now color temperature, to ensure the best possible picture in any lighting condition. CELL TV also boasts ClearScan 480Hz Frame Rate, for a clear, crisp picture for fast motion video. For the flagship ZX900 Series, Toshiba combined the power of the CELL processor with its new KIRA2 Super Local Dimming LED Display. KIRA2 is positioned as “Twice as Bright!” as it has an amazing 1,000 cd/m2 brightness. In addition, KIRA2 also has 512 controllable zones (5X that of previous local dimming models) for precise control over black levels. This allows the KIRA2 to create an unmatched 9M: 1 Dynamic Contrast, creating the ultimate picture quality package. CELL TV also has true 3D TV capability, and much more. For native 3D content, CELL TV uses a Frame Sequential System that changes from 240Hz in 2D mode, to 120Hz for the right eye and 120Hz for the left eye in 3D` mode. This system accepts multiple 3D input formats, including MPEG4-MVC, RealD, and more. However, when true 3D content isn’t available, CELL TV has the solution. TriVector™ 2D to 3D Conversion takes any 2D content and converts it into 3D in real time. This means that with CELL TV you can “Watch Everything in 3D!” including 2D sports, movies, TV shows, video games, and more. 3D TV creates a more immersive home theater experience, and CELL TV’s TriVector 2D to 3D Technology significantly expands the amount of time you can enjoy 3D, truly setting itself apart. CELL TV is also a high-end Home Entertainment Server with a built-in 1TB HDD, BD Player, and 802.11n Wi-Fi. Content can be downloaded from the Internet, transferred from your PC, or recorded directly onto the HDD from the BD Player. The CELL ZX900 Series is the first CELL TV Series, and will be available in large 55” and 65” (diagonal) screen sizes. This two piece system features a Set-top Box, and a display in the new Genesis Design with a black brushed aluminum bezel with acrylic trim.